My introduction to 2E came via a birthday gift of two starters; one TNG and one DS9. I unwrapped the cellophane, fanned through the TNG deck, and put aside Picard, Riker and Worf as I spotted them. "Cool," I thought, reaching the end of the pack, "it already comes with bridge crew". The bridge crew! Where are they? Where is what made TNG so TNG? Where are Picard, Riker, Data et al.? Where’s the ‘star power’? This irked me, but aside from pestering the CC into making a TNG/E classification (to define decks where TNG personnel and ships are in the minority, but still use "Cradle of the Federation" as the sole HQ), what could be done? 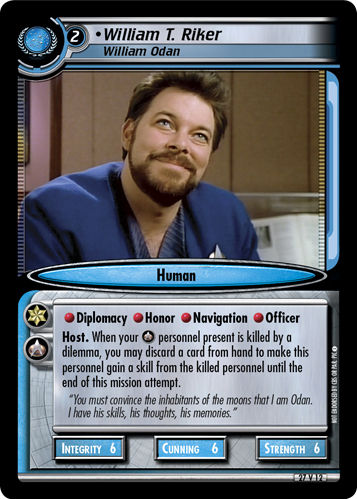 So, when Chris "Maelwys" Lobban approached me at the end of ‘Make It So II’ with regards to a consolation prize, and asked me what TNG cards I’d like to see in an upcoming boutique expansion celebrating TNG’s 25th Anniversary, the answer was obvious: playable bridge crew. As an affiliation, TNG’s skill gaining is fairly limited – Security Drills, Picking Up the Basics and I Need a Little Counseling are good to varying degrees, but as they’re events and an interrupt, they’re vulnerable to both destruction and prevention. Solution – bake the skill-gaining right into the game text, making it unpreventable. TNG can’t Energize, and all their ‘star power’ is expensive. Solution – make them nice and cheap. Their abundant Honor and Officer makes them easy meat for An Issue of Trust and Personal Duty. May I present... William T. Riker, William Odan. I’ll admit, after playtesting, his text is a little different to where he started, but I’m confident he’s better for it; he’s more TNG focused, his game text lets you hang on to the dearly-departed’s skill until the end of the attempt, and he’s cheap to boot. That’s points 1 and 2 covered, right there. Sadly, there was nothing that could be done about number three on the list (having commonplace TNG skills), but, as a Host, if he’s going to be exploring his new keyword, and performing the Rite of Emergence (and gaining Treachery), he’s going to be a sucker for An Issue of Trust anyway, so he might as well have Dip. and Hon. too. I hope you like him. And I hope, given time, he starts creeping into decks and up the list. Failing that, "Charlie – have you ever considered TNG/Earth as a pseudo sub-affiliation...?" In relative terms, I’m still a noob. Okay, there’s an Enterprise-D, but that’s quite a recent addition, only coming from the 23rd expansion. A little pre-emptive teaser there for you. Throughout MiS, I’m pretty sure Charlie said that kind of thing was cool. In all seriousness, his first incarnation was almost 100% Trek-sense, and made almost 0% game sense.